Fresh from landing the Timico Cheltenham Gold Cup with Native River, Joe Tizzard, assistant trainer to his father Colin, is hoping for further big-race success with The Dutchman (10st 10lb). 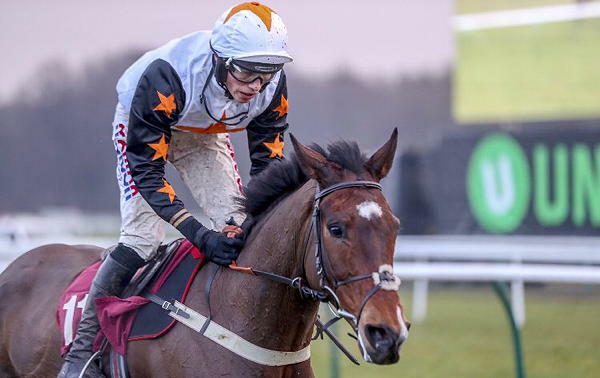 Formerly trained by Berwickshire handler Sandy Thomson, The Dutchman was second to Sam Spinner on his debut for the Tizzard team in a G3 handicap hurdle over just shy of three miles at Haydock in November. Sixth over hurdles at Cheltenham in December, the eight-year-old son of King's Theatre was an impressive 13-length winner of the G2 Peter Marsh Chase over an extended three miles and a furlong at Haydock in January on heavy ground. He was pulled before the 11th fence behind Yala Enki in the G3 Betfred Grand National Trial at Haydock on February 17, after breaking a blood vessel during the extended three mile and four and a half-furlong event, but is on course to tackle the world's greatest and richest chase at Aintree on April 14. The Dutchman is a 33/1 shot with Betway, official betting partner of the Randox Health Grand National Festival. Joe Tizzard said: "The Dutchman is in good form. He broke a blood vessel in the Grand National Trial last time and it was a disappointing performance given the favourable conditions. "He had won impressively on heavy ground in the Peter Marsh Chase at Haydock the time before, but he never seemed to be travelling last time out, despite his record in heavy ground. "We have been easy on him since Haydock and he seems to be really well in himself at the moment. "It wasn't ideal what happened, but he's had seven or eight weeks off and the Grand National is definitely the plan with him. "I think the Grand National should suit. He won nicely in the Peter Marsh over a longer trip and he jumped nicely that day. He's a nice horse who is improving with racing. "We are hopeful that he will stay and he also jumps very well, which is always important for a test like Aintree. "I think he has a fair weight in the Grand National and we have thought about the race for a while. "We haven't made any decision on jockeys or anything, but the plan is definitely to run. "We're hoping the broken blood vessel was just a one off with The Dutchman and we've done everything we can to ensure that he is fully fit after that. It'll be interesting to see what happens in the Grand National as he went up 13lb for that. "The Dutchman will head to David Pipe's one morning to school over the Grand National fences three and that'll be good enough." If The Dutchman is successful at Aintree on April 14, Colin Tizzard would join an elite group of trainers to have saddled the winners of both the Timico Cheltenham Gold Cup and Randox Health Grand National in the same season. The trio to have achieved the feat so far are Basil Briscoe, who won both races with the great Golden Miller in 1934, Vincent O'Brien, who triumphed at Cheltenham with Knock Hard and at Aintree with Early Mist in 1953 and, most recently, Fred Rimell. Rimell was successful at Aintree with Rag Trade in 1976, having taken the Cheltenham Gold Cup earlier in the season with Royal Frolic.